Due August 31st, 2018 - Thump Local is looking for something of a commercial or promotional video – a video that gets their message out there. Your submission can be anything you feel inspired to create – as long as it is within the confines of the Thump Local LLC video contest rules. Video quality is not critical – feel free to shoot something on your phone. Thump Local is just looking for the most clever, creative, inspirational, funny, or just plain unique video content. Make sure to showcase the Thump Local logo in some way in the video. 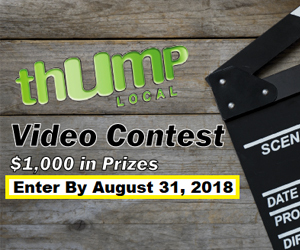 *All Contestants Must Sign and Scan the Thump Local LLC Video Contest Rules Agreement and email to eddie@thumplocal.com to be eligible for this contest. Please feel free and encouraged to incorporate some of these elements into your video. Entries can be anywhere between 15 seconds and 2 minutes in duration. Open worldwide, must be over the age of 18. Thump Local is looking for something of a commercial or promotional video – a video that gets their message out there. Entries can be anywhere between 15 seconds and 2 minutes in duration.